Too Old to Learn Flute? My last few posts were about me and my history as a musician. Today, I wanted to talk about you. The aspiring musician or new musician who wants to learn but is maybe afraid of what could be a huge barrier. That is age. But age doesn’t have to be a barrier. In fact, it can help. I was a bit older when I started playing the flute; I was 16. Most people start learning at the age of 9 or 10. Now, I did have about ten years of music experience under my belt when I began the instrument. That made things easier. Still, I believe that it is never to late to learn a musical instrument. Here is why. A lot of young children struggle to learn an instrument because they don’t have the focus necessary to improve. I was one of these kids who never wanted to practice, and I didn’t like spending time disciplining myself through practice. As we get older, our focus usually gets better. It becomes much easier to focus on the task at hand, and it can make learning an instrument much more enjoyable. At age 16, I knew that I wanted to pursue music in some form, professionally or not, so I was much more dedicated to playing than if I had started early on. If you are a teenager or an adult, use your ability to focus to your advantage. You won’t have to spend as much time working on the most basic of exercises. You can progress more quickly than if you don’t concentrate. When you are older, you have more independence than when you are a child. You can decide (within reason) what instrument and music you want to play. You can decide how you learn and who the best teacher is for you. The (musical) world is your oyster. There are opportunities out there that are not available to younger students. There are many websites that can be used to help learn musical concepts. If you are struggling with theory, aural skills or performance anxiety, there is something out there for you. You can also download apps designed for musicians. While children can use the internet, they usually need access or assistance from a parent. It almost makes more sense for children to use printed books to learn from. Especially because of online distractions. As an older beginner, you can use online tools from the get go, thus making your musical education even more interesting. It is thought by many that studying music can delay the onset of different neurological diseases such as dementia. No matter when you learn an instrument, you can reap the rewards of your hard work. There are also benefits unrelated to your brain. Music makes people happy, and playing music is even better. It is one thing to listen to your favorite composer or artist, and it is a whole other thing to actually play one of your favorite songs or pieces. Thought of as either good or bad, older beginners don’t have the same stress of considering a music career as child musicians. It is possible to pursue a music career at a later age, but it takes a lot of work. It is not guaranteed. If you start when you already know what your career will be, you don’t have to stress about being perfect. You can play music for the fun of it. Music is a great way to relax and destress. Having a creative hobby is awesome, because you can express yourself in a way that many people can’t. 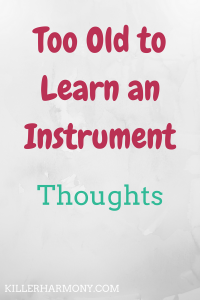 I think that anyone who really wants to learn an instrument can. Age should not be a factor in determining your ability to do something. There is probably an age where after that, music becomes harder, however it is still possible. If you find a teacher who is willing to work with you, playing music is well within your reach. My dad just started learning guitar with no prior music experience. He only had the desire to learn a new skill. With any new skill, it takes time to master that skill. Older brains are not as moldable as young ones. That’s okay. With age, we also become more disciplined and motivated to do what we want to do. 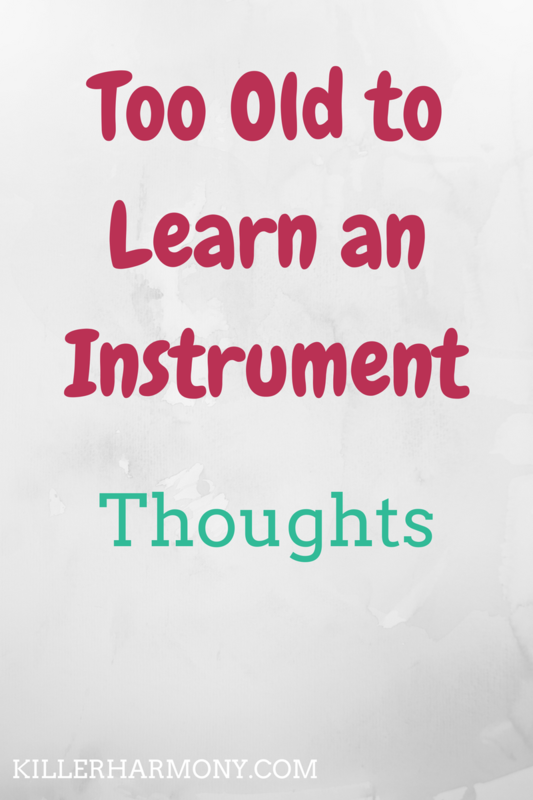 Have you started a musical instrument later than “normal”? Let me know in the comments below about your experience!